Sheet mulching is a great way to build your soil! You can sheet mulch right over grass, weeds or to improve poor soil. We recommend sheet mulching over the use of a rototiller anytime. The best time of year to mulch is late in the fall or early spring but really, sheet mulching can be applied at anytime. Ideally, you want a 25:1 Carbon to Nitrogen ratio to provide enough energy for protein production. All live green vegetation including green leaves and grass, seaweed, hay, vegetables & garden waste. Coffee grounds are rich in nitrogen so save your grounds! Manure – chicken, sheep, goat, cow, all a great source of nitrogen. Make sure to ask the farmer if they use any antibiotics or harmful chemicals; you don’t want them in your soil. Carbon is all things brown. 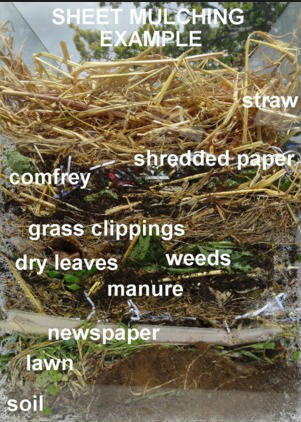 Straw, cardboard – good plain brown un-waxed cardboard –worms love to eat cardboard and their output is humus so really, it’s a winning combination for soil building. Newsprint – plain, uncolored newsprint. Use thick layers when sheet mulching so that weeds and unwanted vegetation do not come through the layers. Be sure to water each layer as you build! Apply soil amendments – bone/blood meal, dolomite rock dust, greensand, etc. You can also add a layer of compost if available. This is also a great time to put down any vegetable or garden waste. Add a layer of cardboard or thick newsprint (wet them down before applying). Next, add a layer of coffee grounds or manure. Repeat layer upon layer, alternating layers of nitrogen and carbon up to 18”in height. Almost immediately, the worms start breaking down the carbon, the soil microbes and bacteria grow and multiple transforming this material into a rich complex soil structure! Place top soil on top and start growing…your garden will be rich in nutrients for years as the sheet mulching breaks down! Enjoy exploring other great articles on Sheet Mulching or Lasagna Gardening over the internet.